aerobd.news : VistaJet, the first and only global aviation company, today announced at the Asian Business Aviation Conference & Exhibition (ABACE) in Shanghai that it is the first international private aviation operator to launch a WeChat sales platform available for instant global fleet access. Aimed at those who frequently charter business aircraft, the innovative platform will allow Chinese corporations, travel departments, and ultra-high net worth individuals to request flights in the simplest way. 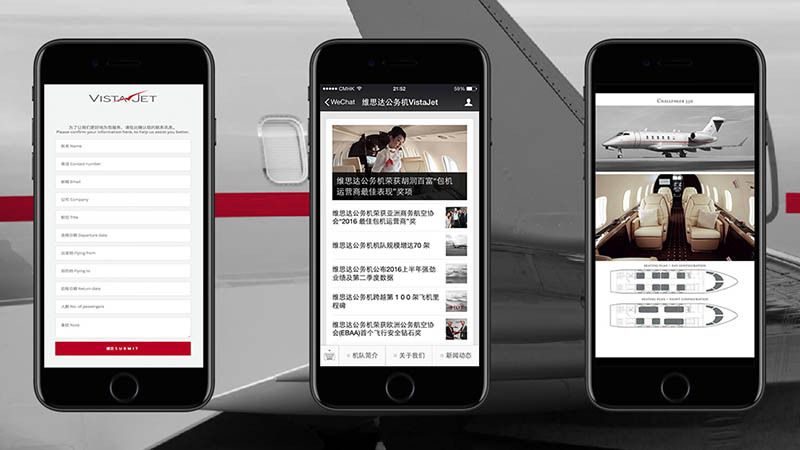 The WeChat service is the latest route to providing access to VistaJet’s fleet of 72 silver and red Global and Challenger aircraft, straight from customers’ mobiles. The launch of the VistaJet WeChat sales platform stems from the company’s careful observation of the local market and close collaboration with its Chinese customers and partners on its technology strategy. With 17% of its global customer base represented by the greater China region, the company observed that the majority of principal Chinese customers use WeChat instant messaging to communicate directly with their dedicated sales representatives. By developing this digital channel, VistaJet saw the potential to offer its award-winning private jet travel experience to a larger, digitally active customer base. Its sales teams are available twenty-four hours a day, seven days a week to support users of the WeChat platform. Customers will be able to request one-off charter flights or purchase blocks of flying hours through the Company’s signature Program product. The onboard experience will be just as tailored: Passengers can enjoy an authentic Chinese tea service, request Mandarin and Cantonese speaking cabin staff, and may order dining options from their favourite restaurant or hotel. VistaJet’s performance in Greater China was particularly strong in 2016, contributing to a 23% growth in flight traffic during the year. In Q1 2017, the Company has doubled sales of flight hours compared to Q1 2016, and the momentum is expected to continue. VistaJet has been offering its international flight experience on domestic China flights since 2015 when it placed its first dedicated Chinese-registered aircraft in partnership with Apex Air. The most visited cities in Mainland China in 2016 were Beijing, Shenzhen, Shanghai, Tianjin, Guangzhou. The top 3 overseas destinations departing from Mainland China in 2016 were Kuala Lumpur, Singapore, Seoul. VistaJet was voted the Best Charter Operator Award 2016 by Asian Business Aviation Association (AsBAA) and Business Jet Operator Star Performer 2017 at Hurun Report’s ‘Best of the Best’ Awards. “For VistaJet, being global means not only flying our customers anywhere they wish to go to, but also creating a service dedicated to regional cultural demands. Our Chinese consumers don’t tend to use email as a primary communication tool, and instead pointed us to the incredible popularity of WeChat. Launching a WeChat service is a huge opportunity to allow people to talk to our team – anytime, anywhere – and enable us to provide Chinese customers with the best experience in the industry.